This is an exciting time to be in the massage profession, with research that is shedding new light on different facets of our work. Pain is the most common reason people seek the care of a massage therapist, and the more we understand about pain, the better we can participate in a comprehensive solution to address it. A key misunderstanding with a number of treatment strategies is the role of nociceptors (which many call pain receptors). Many of us in the healthcare professions today were taught a relatively simple, and decidedly mechanistic, physiological explanation for how pain is perceived and transmitted in the body. This model actually goes back to the time of the philosopher, Rene Descartes, in the 17th century. Descartes’ philosophy has carried through to form the philosophical foundation of our perspective of the body. When you hear the term, “Cartesian”, in relation to mathematical or scientific ideas, that means to some extent it follows Descartes’ influence. Our understanding of pain transmission has, of course, evolved since the time of Descartes, but there is a great deal of similarity between his original ideas and those of our recent training. Yet much of the ‘body as a machine’ philosophy – i.e. the mechanistic view of the body -continues. 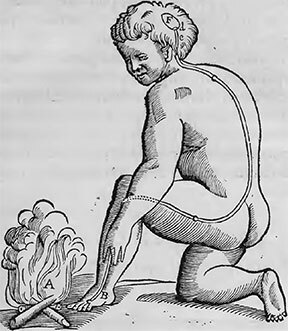 Descartes suggested that when there is a noxious stimulus, like getting too close to a fire, a pain stimulus traveled from the contact point along a pathway of pain fibers to the brain (Image 1). Based on this idea, the predominant methods of pain management involved trying to block pain fibers before they got to the brain. This idea has continued to influence modern pain management to a significant degree. More recent neuroscience has modified these ideas, but many are still taught that the body has pain receptors that once stimulated, send a pain signal to the brain. However, there aren’t actually ‘pain receptors’ so to speak. But, before we get into the finer details of how pain interpretation actually works, let’s explore a simple example to see why that idea doesn’t pan out. If you were crossing the street in a quiet neighborhood with no traffic and suddenly sprained your ankle while in the middle of the road, there’s a good chance you would feel pain right away and then calmly limp to the side of the road. If, however, you were crossing a very busy street when you sprained your ankle and also noticed a large bus bearing down on you, your reaction would be quite different. Most likely you would sprint to safety on the side of the road first. Only then would you begin to feel pain in your ankle. If there were pain receptors in your ankle, they would send pain signals to the brain immediately in either instance. In the second example, the ankle pain may have kept you from focusing on the more important survival task of the moment—getting out of the way of the oncoming bus! We now recognize that pain is far more complex than previously thought. Pain signals do involve sensory receptors connected to nerve fibers that go to the brain. The sensory receptors responsible for sending information about a noxious stimulus, like when you sprain your ankle, are called nociceptors. They are sensitive to chemical, mechanical, and thermal stimuli. But pain isn’t felt until the brain receives those signals and interprets the input as pain. This activity happens instantaneously and it isn’t under conscious control. It is helpful to think about pain as an alarm that is generated by our body, just like the alarm system that may be protecting a home. Multiple sensors around the house are detecting motion or sound and the system is determining which ones are minor (like a leaf falling in front of the door) and which ones are important (someone breaking into the house). The alarm signal doesn’t go off with every sensor change, only with the ones that are indicative of a potential threat. Just like that alarm system for your house, the nociceptors send many signals to the brain but the alarm (pain) isn’t set off until that information is processed and it is determined that a significant threat exists. Therefore, we now talk about pain being an output of the brain and not a ‘pain signal’ that is coming from the periphery and traveling to the brain. It is very much like the other senses we have. For our hearing, sound waves are captured by the eardrum, but it is not conceived of as a recognizable sound until the brain organizes the information received from the sensory receptors in our ear. The idea that pain is an output of the brain should not be confused with dismissive statements that are often given to patients whose pain is still a mystery to their healthcare provider. In some cases when a healthcare professional has not been able to identify a clear biological cause of pain, the patient or client may be told the pain is psychosomatic or “all in their head.” That is NOT what is being implied by stating pain is an output of the brain. Pain can come from many factors and pain without obvious tissue damage is just as real as pain felt by the person who has an observable injury. It is common to find people who have very little or no apparent tissue damage but a great deal of pain. Conversely, it is also easy to find people who have significant tissue damage, but no pain (or pain that comes on much later than the initial tissue insult). Examples include highly competitive athletes or soldiers where individuals were severely injured but did not feel pain because there was something more important that the brain was focused on (winning the competition in the athletic example, or staying alive in the event of battlefield injury). Both of these situations produce a clinical conundrum that is hard to explain with the former Cartesian model of pain receptors sending pain signals from the periphery to the brain. So how do pain signals actually work? To fully grasp how pain sensations are produced, it is helpful to review some basic principles of neuroanatomy. Not all massage therapists are taught these details about the nervous system in their basic training, so this is a great opportunity to polish your understanding of these concepts. When a nerve fiber is myelinated, that means it is covered by a myelin sheath (Image 2). 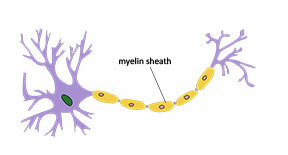 The myelin sheath helps the nerve impulse travel along the length of the nerve at a much faster rate. The rate of signal transmission plays a crucial role in pain perception and also how that sensation can be magnified or diminished. In 1965 two researchers, Ronald Melzack and Patrick Wall, published a paper outlining a new theory of pain modulation that emphasized an expanded role for the central nervous system and de-emphasized the notion of pain receptors in the periphery and the idea they were sending ‘pain signals’ to the brain. This theory has come to be known as the Gate Theory of pain. While it has been modified from its original presentation, there is still strong evidence to support the idea that signal transmission and the experience of pain can be modified the way they originally described it. Let’s take a look at how that works. 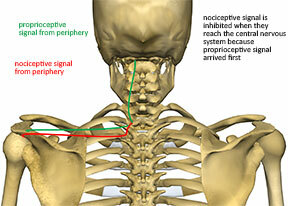 Nociceptive signals are sent from specialized sensory receptors in the periphery of the body. Once those sensory receptors are activated they send a message primarily along the Aδ and C fibers. But the body is also getting sensory information from other receptors simultaneously. Proprioceptive signals about the body’s position in space and signals about joint position from mechanoreceptors are traveling on the much faster Aα and Aβ nerve fibers. They get to ‘processing stations’ in the spinal cord and central nervous system faster than the nociceptive signals traveling on the Aδ and C fibers (Image 3). The gate theory suggests that there is a neurological ‘gate’ (not truly a mechanical gate, but a metaphorical one) in the spinal cord that closes down to limit the amount of information being sent to the brain for processing. When the proprioceptive signals arrive at the gate first, the gate shuts down to the slower-traveling nociceptive signals. With fewer nociceptive signals getting through, there is decreased pain sensation. The benefit of mechanoreceptors and proprioceptors outpacing the nociceptive signals means that the most important stimuli is perceived by the brain first, as in the example of the person with the sprained ankle sprinting to the sidewalk to avoid a bus. This mechanism also explains why rubbing a painful body area reduces the pain experienced in that moment. Massage therapists should take note that some of the positive effects of massage related to pain management may very well be attributed to mechanisms described by the gate theory. We have yet to research this fully, but certain techniques like active engagement methods where there is simultaneous massage along with concentric or eccentric muscle engagement may be capitalizing on the pain gating process. It is likely that proprioceptive information coming from the massage technique along with the joint movement and muscle contraction closes the gate on nociceptive signals and thereby decreases pain. Our current understanding of pain signal transmission also sheds some interesting light on pain experiences our clients present to us. When nociceptive signals reach the central nervous system they travel through the spinal cord and then ascend through the lower, mid, and upper portions of the brain until they are fully processed. As they travel through these different sections, the intensity of the signals can be altered. Various factors can cause pain signals to be amplified; this is called ascending facilitation. Think of it as ‘turning up the volume’ on the nociceptive signals that are arriving. Ascending facilitation can create two characteristic clinical experiences; hyperalgesia and allodynia. Hyperalgesia is when something is much more painful than it ordinarily should be. Allodynia is when something is painful that shouldn’t be (like when a client reports that gently stroking the skin is painful). Obviously our goals of pain treatment are to decrease any ascending facilitation that may be occurring. There are fascinating new developments in our understanding of how pain is experienced and the various strategies we can use to help manage our client’s pain. The more we understand about the pain process, the better we will be at adapting our massage treatment to take the best advantage of how pain transmission occurs in the body. In upcoming installments we will further explore some of these important concepts about how to use this new research to best help our clients. Moseley L, Butler D. Explain Pain Supercharged. Adelaide, Australia: Noigroup Publications; 2017. Vigotsky AD, Bruhns RP. The Role of Descending Modulation in Manual Therapy and Its Analgesic Implications: A Narrative Review. 2015;2015. doi:10.1155/2015/292805.